(7) generally amend the County noise control law. (a) The County Council finds that excessive noise harms public health and welfare and impairs enjoyment of property. The intent of this Chapter is to control noise sources to protect public health and welfare and to allow the peaceful enjoyment of property. This Chapter must be liberally construed to carry out this intent. (b) The Department of Environmental Protection administers this Chapter. (1) The Department must coordinate noise abatement programs of all County agencies, municipalities, and regional agencies. (2) A County agency, municipality in which this Chapter applies, or regional authority subject to County law must not adopt a standard or regulation that is less stringent than this Chapter or any regulation adopted under this Chapter. (3) The Director may form an Interagency Coordinating Committee to assist the Director in coordinating noise control policy. If the Director forms the committee, the Director must designate an individual to chair the committee. The members of the committee should be designated by County, local, and regional agencies that the Director invites to participate. (4) The Department must establish procedures to identify and reduce noise sources when the County plans and issues permits, variances, exemptions, or approvals. (5) The Department should make recommendations to the County Executive, County Council, and Planning Board regarding noise control policy, regulations, enforcement, and noise sensitive areas. (a) Construction means temporary activities directly associated with site preparation, assembly, erection, repair, alteration, or demolition of structures or roadways. (b) dBA means decibels of sound, as determined by the A-weighting network of a sound level meter or by calculation from octave band or one-third octave band data. (c) Daytime means the hours from 7 a.m. to 9 p.m. on weekdays and 9 a.m. to 9 p.m. on weekends and holidays. (d) Decibel means a unit of measure equal to 10 times the logarithm to the base 10 of the ratio of a particular sound pressure squared to the standard reference pressure squared. For this Chapter, the standard reference pressure is 20 micropascals. (e) Department means the Department of Environmental Protection. (f) Director means the Director of the Department of Environmental Protection or the Director's authorized designee. (2) for a noise originating from an animal source, the Director of the Division of Animal Control and Humane Treatment in the Police Department or the Director's authorized designee. (h) Impulsive noise means short bursts of an acoustical energy, measured at a receiving property line, characterized by a rapid rise to a maximum pressure followed by a somewhat slower decay, having a duration not greater than one second and a field crest factor of 10 dBA or more. Impulsive noise may include, for example, noise from weapons fire, pile drivers, or punch presses. (i) Leaf blower means any portable device designed or intended to blow, vacuum, or move leaves or any other type of unattached debris or material by generating a concentrated stream of air. Leafblower includes devices or machines that accept vacuum attachments. (j) Nighttime means the hours from 9 p.m. to 7 a.m. weekdays and 9 p.m. to 9 a.m. weekends and holidays. (k) Noise means sound, created or controlled by human activity, from one or more sources, heard by an individual. (1) Residential noise area means land in a zone established under Section 59-C-1.1, Section 59-C-2.1, Division 59-C-3, Section 59-C-6.1, Section 59-C-7.0, Section 59-C-8.1, Section 59-C-9.1 for which the owner has not transferred the development rights, or Section 59-C-10.1, or land within similar zones established in the future or by a political subdivision where Chapter 59 does not apply. (2) Non-residential noise area means land within a zone established under Section 59-C-4.1, Section 59-C-5.1, Section 59-C-9.1 for which the owner has transferred the development rights, or Division 59-C-12, or land in similar zones established in the future or by a political subdivision where Chapter 59 does not apply. (n) Noise sensitive area means land designated by the County Executive as a noise sensitive area under Section 31B-8. (o) Noise-suppression plan means a written plan to use the most effective noise-suppression equipment, materials, and methods appropriate and reasonably available for a particular type of construction. (p) Person means an individual, group of individuals, corporation, firm, partnership, or voluntary association; or a department, bureau, agency, or instrument of the County or any municipality, or of any other government to the extent allowed by law. (3) 15 dB for center frequencies less than or equal to 125 Hz. (r) Receiving property means any real property where people live or work and where noise is heard, including an apartment, condominium unit, or cooperative building unit. (s) Sound means an auditory sensation evoked by the oscillation of air pressure. (t) Source means any person, installation, device, or animal causing or contributing to noise. The County Executive may establish noise control regulations and standards as necessary to accomplish the purposes and intent of this Chapter. Any regulation must be at least as stringent as this Chapter. The Executive by regulation may set fees that are sufficient to offset the costs of Department reviews or other actions required or authorized by this Chapter. 3lB-4. Noise Control Advisory Board. (a) A Noise Control Advisory Board must advise the County Executive, Director, County Council, and Planning Board on noise control issues, including administration and enforcement of this Chapter. (b) The Board consists of seven members appointed by the Executive and confirmed by the Council. (c) The Board must elect one member as Chair and another member as Vice-Chair to serve at the pleasure of the Board. The Board must meet at the call of the chairperson as required to perform its duties, but not less than once each quarter. A majority of the members of the Board constitutes a quorum for transacting business. The Board may act by a majority vote of those present. (d) At least every third year, the Board must evaluate the effectiveness of the County's noise control program and recommend any improvements to the Director, County Executive, County Council, and Planning Board. (e) No later than March 1 each year, the Chair of the Board must report to the Director, County Executive, County Council, and Planning Board on activities and actions the Noise Control Advisory Board took during the previous calendar year. 3lB-5. Noise Level and Noise Disturbance Violations. (2) A person must not cause or permit the emission of a prominent discrete tone or impulsive noise that exceeds a level, at the location on a receiving property where noise from the source is greatest, that is 5 dBA lower than the level set in paragraph (1) for the applicable noise area and time. (3) Sound that crosses between residential and non-residential noise areas must not exceed the levels set in paragraph (1) for residential noise areas. A person must not cause or permit noise that creates a noise disturbance. (B) as a danger warning signal during daytime hours if the device complies with noise level limits. (2) Operating a sound-producing device on public streets for commercial advertising or to attract public attention. (3) Selling anything by outcry. (4) Loading, unloading, opening, closing or otherwise handling containers, building materials, construction equipment, or similar objects. (5) Operating a device that produces, reproduces, or amplifies sound. (6) Allowing an animal to create a noise disturbance. (7) Operating power equipment mounted on a motor vehicle or operating other devices powered by a generator or a motor vehicle. 31-6. Noise Level and Noise Disturbance Standards For Construction. (a) Maximum allowable noise levels for construction. (ii) 85 dBA if the Department has approved a noise-suppression plan for the activity. (B) The level specified in Section 31B-5 at all other times. (2) Construction noise levels must be measured at the location, at least 50 feet from the source, on a receiving property where noise from the source is greatest. (3) The Department must by regulation establish requirements for noise-suppression plans and adopt procedures for evaluating and approving plans. The regulations must provide that, at least 10 days before approving a noise-suppression plan, the Director must provide public notice reasonably calculated to reach at least a majority of households that might be affected by the construction activity noise levels above 75 dBA. 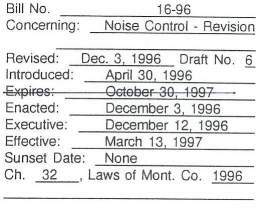 The prohibition on noise disturbance in Section 31B-5(b) applies to construction activities, notwithstanding subsection (a). (1) Delivering materials or equipment, or loading or unloading during nighttime hours in a residential noise area. (2) Operating construction equipment with audible back-up warning devices during nighttime hours. (a) The Department must issue regulations establishing the equipment and techniques it will use to measure sound levels. The Department may rely on currently accepted standards of recognized organizations, including the American National Standards Institute (ANSI), American Society for Testing and Materials (ASTM), and the United States Environmental Protection Agency. (b) For multiple sources of sound, the Department may measure sound levels at any point to determine the source of a noise. (a) The County Executive may designate by regulation land within any geographical area as a noise sensitive area to protect public health, safety, and welfare. The regulation may prohibit certain noise producing activities in the noise sensitive area. (4) describe by example or enumeration activities or sources that violate the limits or requirements. (c) A regulation under subsection (a) may establish limits or requirements for a noise sensitive area that are more stringent than those that otherwise would apply to the area under this Chapter. (a) Except as provided in this Section, a person must not sell, buy, offer for sale, or use a leaf blower at any time that has an average sound level exceeding 70 dBA at a distance of 50 feet. This requirement is in addition to any other noise level or noise disturbance standard that applies under this Chapter. (b) An individual who owns or occupies a residence in a residential noise area may use at the individual's residence a leaf blower bought or manufactured before July 1, 1990, until July 1, 1998, even if it exceeds the standard in subsection (a). After July 1, 1998, a person must not use any leaf blower that violates the standard in subsection (a). (c) The Department must apply the standard in subsection (a) in accordance with the most current leaf-blower testing standard of the American National Standards Institute (ANSI). (d) The Department may inspect, and on its request a person must produce, any leaf blower that is sold, offered for sale, or used in the County, to determine whether the leaf blower complies with this Section. A person who relies in good faith on a manufacturer's written representation of the sound level of a leaf blower that has not been modified is not subject to a penalty for violating this Section. (4) sound, not electronically amplified, created between 7 a.m. and 11 p.m. by sports, amusement, or entertainment events or other public gatherings operating according to the requirements of the appropriate permit or licensing authority. This includes athletic contests, carnivals, fairgrounds, parades, band and orchestra activities, and public celebrations. (b) The County Executive may issue regulations exempting from Section 31B-5 sources associated with routine residential living during daytime hours, such as home workshops, power tools, and power lawn and garden equipment, when used in accordance with manufacturer specifications. This exception does not apply to repairs or maintenance on a motor vehicle that is not registered for use on public roads. (1) The Director may waive any part of this Chapter for a temporary event if the noise the event will create or cause in excess of the limits established under this Chapter is offset by the benefits of the event to the public. (2) When the Director receives an application under this subsection, the Director must provide public notice of the application reasonably calculated to reach at least a majority of households that might be affected by noise levels anticipated for the event that is the subject of the application. The Director must not approve an application under this subsection less than 10 days after the public notice. (1) The Director may waive any part of this Chapter if the Director determines that compliance in a particular case is not practical and would impose undue hardship. (2) When the Director receives an application under this subsection, the Director must schedule a hearing on the application within 60 days. (B) posting a sign at the location of the source. (4) Based on evidence presented at the hearing, the Director may grant a waiver for up to 3 years, under terms and conditions appropriate to reduce the impact of the exception. (5) The Director may renew a waiver granted under this subsection if the applicant shows that the circumstances supporting the original waiver have not changed. (c) Violation of Waiver. The Director may suspend, modify, or revoke a waiver granted under this Section if a person violates the terms or conditions of the waiver. (4) specify the requirements for the hearing advertisement and sign required under subsection (b)(3). (a) The Department must enforce this Chapter. The County Executive may delegate in writing the authority to enforce parts of this Chapter to the Police Department or any other Executive agency. (b) A violation of this Chapter is a Class A violation. Each day a violation continues is a separate offense. A violation of Section 31B-6 is a separate offense in addition to any other violation of this Chapter arising from the same act or occurrence. (c) The Department may seek injunctive or other appropriate judicial relief to stop or prevent continuing violations of this Chapter. (e) The compliance plan referred to in subsection (d)(4) must establish a schedule for achieving compliance with this Chapter, as specified in the corrective order. A compliance plan, and amendments to a plan, are not effective until the Director approves the plan or amendment. An action allowed under an approved compliance plan does not violate this Chapter. (2) receives complaints from at least two witnesses of a noise disturbance. Complaints by two witnesses are required to issue a citation under paragraph (2), but are not required to prove that a person violated this Chapter. (g) The Director of the Division of Animal Control and Humane Treatment may initiate administrative action before the Animal Matters Hearing Board instead of an enforcement officer issuing a citation under subsection (f) for a violation of this Chapter originating from an animal source. (h) A person aggrieved by any action or order of the Director under Sections 31B-9 and 31 B-ll may seek reconsideration within 10 days after the date of the action or order. A request for reconsideration must be in writing to the Director, and must specify the date and nature of the action or order, the injury sustained, the remedy requested, and the legal basis for the remedy. If the Director finds that there are material facts in dispute, the Director may refer the matter to a hearing officer under the procedures specified in Chapter 2A. If the Director finds that there are no material facts in dispute, the Director must make a final decision on the request for reconsideration in writing within 45 days after receiving the request. The aggrieved person may appeal from the Director's final decision within 30 days after the Director issues the decision, as provided in Section 2A-11. (1) A person responsible for a violation of Section 31B-6 and the person responsible for the management or supervision of the construction site where the source of the violation is located are jointly and severally liable for the violation. (C) 7 working days per offense for the fourth and subsequent violations within a 120-day period. (3) This Chapter does not limit the Director's authority under Chapter 8 to revoke a permit or approval issued under that Chapter. Any person aggrieved by a violation of this Chapter may file a civil action in any court with jurisdiction against a person responsible for the alleged violation. The aggrieved person must notify the alleged violator and the Director of the alleged violation at least 60 days before filing the action. A person must not file an action under this subsection if the County Attorney has filed a civil action against the same alleged violator regarding the same violation.